while you slowly settle down"
From out the mists of ancient Celtic forests comes this talented musician to entertain you with songs of lore and legend, soulful airs and spritely dance tunes of that twilight time betwixt the ages. With a repertoire filled to overflowing with original and traditional music of the British Isles, you will be entranced as her songs and stories ease your hardships and affirm your hopes. 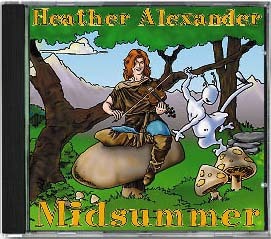 Like the bards of old, Heather Alexander weaves a rich tapestry of tuneful tales and magical music, enchanting the listener into a world where anything can happen! Her fiery fiddle will have you bouncing to the beat of a rowdy reel or brimming with the tears of an Irish aire. Whether performing at pubs or private parties, Heather Alexander captures a timeless Celtic spirit; like the tales of a travelling tinker or a walk in the misty, foggy dew. Born in the San Francisco Bay Area, Heather Alexander was raised with the customs of the Isles firmly bred into her by her mother and grandmother, both natives of Britain. Her father, a full blooded Missourian and a prominent jazz vocalist/guitarist of the forties began Heather’s formal education at the age of six when he started teaching her music. By age nine, she was teaching herself to play the violin. She later began composing songs on guitar, and honed her skills with several years of private study in music, voice and drama. Heather has performed in a broad spectrum of contexts— from opera to country music. Keepers of the Flame, which was released on Heather’s own label, Sea Fire Productions early in 1990. Both the album and the band achieved a high degree of local popularity, and fame. In 1991, when Phoenyx disbanded, Heather returned to her acoustic roots and embarked on a solo career. For over ten years, Heather has been performing solo at pubs, coffee houses and festivals from L.A. to Seattle, and across the nation. With guitar, fiddle and bodhran, she presents original and traditional Celtic music that is received with enthusiasm by audiences of all ages. She has worked with and opened for many notables, including Tempest, Tommy Makem, the Clancy Brothers, Tom May, Darby O’Gill and the Wicked Tinkers. She has performed on several albums, either as an instrumentalist, vocalist, composer or arranger. 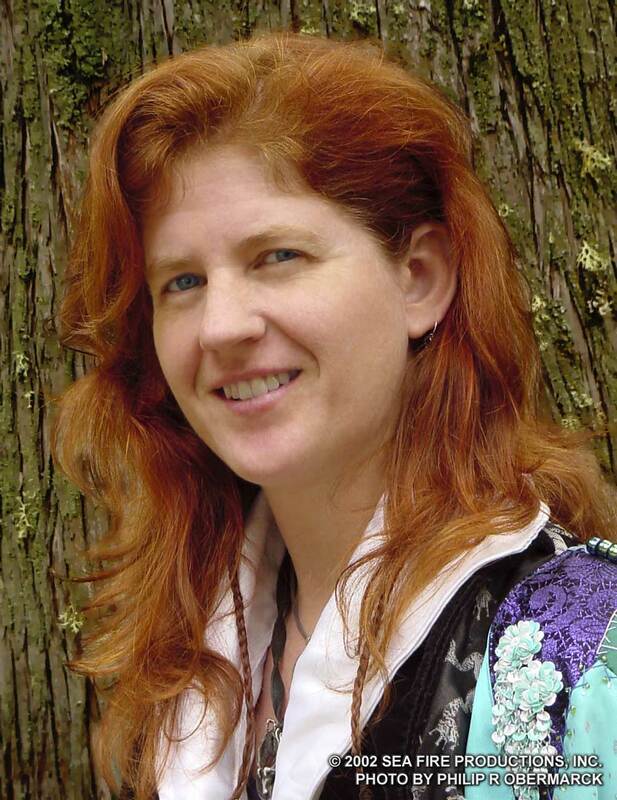 In 1994, Heather produced her first solo CD, Wanderlust, a collection of original music based on traditional Celtic themes, described by Dirty Linen Magazine as "…tunes and stories that rarely fail to delight, especially with that incredible voice and wild fiddle playing…rivals many Celtic artists for capturing the legendary nature of the Emerald Isle." Released on her independent label, Sea Fire Productions, Wanderlust has been well received across the U.S. as well as internationally. Heather has release four subsequent albums, and each one has been equally successful. In 2001, she debuted her band, Uffington Horse, a synthesis of Celtic Folk and World Rock. With bass and percussion backing her up, she can present an eclectic folk rock sound that keeps the audience dancing! Heather’s latest album was released in February of 2002 and is being hailed as her best work yet. Insh’Allah: The Music of "Lion's Blood", is a collaborative production with fantasy author Steven Barnes, inspired by his latest novel "Lion's Blood". This album, a departure of sorts, presents the listener with a world where Africa colonized America, using Irish slaves. The music has an unique Afro-Irish feel, with rich vocal textures and strong rhythms. She is currently working on a live album of more traditional Celtic songs, for release in 2003. A benefit to the wide range of establishments that Heather performs at is her ability to adapt her presentation to fit the needs of the house, from solo performer to full band, and still maintain a quality of excellence and high professionalism. © 1989, 2000, 2003 Sea Fire Productions, Inc.
Used with permission. All rights retained by the artist. This music can be freely distributed as part of this collective cdrom, but cannot be resold, under terms described in the license agreement for this disc.